Economists rarely advocate higher taxes on a good or service because higher taxes often increase the price that consumers pay and lower the price that producers receive--a "lose-lose" situation for both consumers and producers. However, Pigovian taxes, which are used to correct situations in which the free market produces an inefficient result, might actually increase social welfare. Greg Mankiw, an economist at Harvard and founder of the Pigou Club, argues that such taxes are currently needed on gasoline, due to the negative externalities that accompany gasoline consumption. A negative externality is a cost imposed on a third-party by the consumers and the producers of a good or service. Take for example, gasoline. Oil companies produce and distribute large amounts of gasoline to satisfy America's desire to drive. How does a person who uses gasoline hurt other people? First, burning gasoline emits toxic chemicals such as carbon monoxide and carcinogens that damage public health. Second, cheap gas contributes to excessive driving which wears down our country's highways and causes traffic congestion. Third, as Al Gore argues, burning gasoline produces carbon dioxide, which contributes to global warming. Fourth, as Thomas L. Friedman has argued, high oil revenues actually support regimes like Iran and Venezuela, decreasing freedom in those countries as well as our own national security. 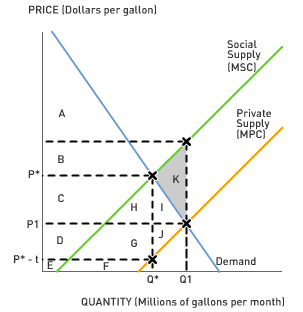 If the consumption of gasoline imposes a negative externality, then economists say that the marginal social cost (MSC) of gasoline exceeds the marginal private cost (MPC). The invisible hand fails to bring the market to an optimal outcome because the free market equates demand and private supply, and does not take external costs into account. Ideally, the market would equate demand and social supply, but rational consumers would not take into account external costs because they feel someone else should reduce their consumption of gasoline (free-rider problem). The free market leads to an almost shocking result: the price of gasoline (P1) is below the socially-optimal price (P2), and the quantity of gasoline consumed (Q1) exceeds the socially-optimal quantity (Q2). In other words, in a free market, Americans consume too much gas! The government may remedy the situation by increasing the per-unit tax on gasoline. Higher gas taxes would increase marginal private cost and reduce the gap between social supply and private supply. 1. In a free market, the price of gas is P1 and the quantity of gas consumed is Q1. In this case, what is consumer surplus plus producer surplus minus total external costs? 2. Suppose the government imposes a per-unit tax on gasoline that forces the market to price and produce the socially-optimal quantity (Q2). What is consumer surplus plus producer surplus plus government revenue minus total external costs? 3. An action should be taken if and only if the benefits outweigh the costs. What are the costs of the gas tax in this example? What are the benefits? Which one outweighs the other? 4. The above example assumes the government has perfect information about the size of the externality caused by gasoline. But in reality, measuring the costs and benefits (especially when it comes to things like climate change or the effects on national security) can be difficult. Does this problem of imperfect information mean we should not impose Pigovian taxes? If you think we still should impose Pigovian taxes, what does the problem of imperfect information imply about the optimal level of taxation? Your comment ignores the value of the commodity. Economies are the output of oil and gas. That is to say economic output is the direct result of energy inputs. The U.S. taxes on gasoline are lower then anywhere else in the world. Therefore, when it comes to industrial might the U.S. has a lower input cost in comparison to other countries. Any increase in taxes on gasoline will remove the inherent competitive advantages that the U.S. currently enjoys. If the Europeans want to enhance the competitive nature of their economics then reducing the taxes on energy will provide them with an equaling of the costs the americans currently enjoy. Yes, the US currently enjoys the low prices, but I think you entirely ignored the issue of externalities. What good is a low gas cost when your entire planet is slowly dying?